Novel anti TB (tuberculosis) agents with mechanisms of action distinct from current TB drugs are urgently needed due to the increasing prevalence of Drug Resistant (DR) TB. As part of our TB drug discovery strategy, we revisited forgotten antibiotics with high anti-TB potential and re-discovered griselimycin (GM). GM is a natural cyclic depsipeptide, identified in the 1960’s, structurally unrelated to any known TB drug and active against sensitive and DR-Mycobacterium tuberculosis. We developed a total synthesis to access to GM analogues and to be able to prosecute a lead optimization program. Following an optimization program, we discovered an outstanding TB compound, Cyclohexylgriselimycin (CGM) which was selected for in depth profiling. This compound displayed excellent anti-TB properties comprising in-vivo activity alone and in combinations. We discovered that resistance to griselimycins, occurring at very low frequency, was associated with amplification of a chromosomal segment containing DnaN. 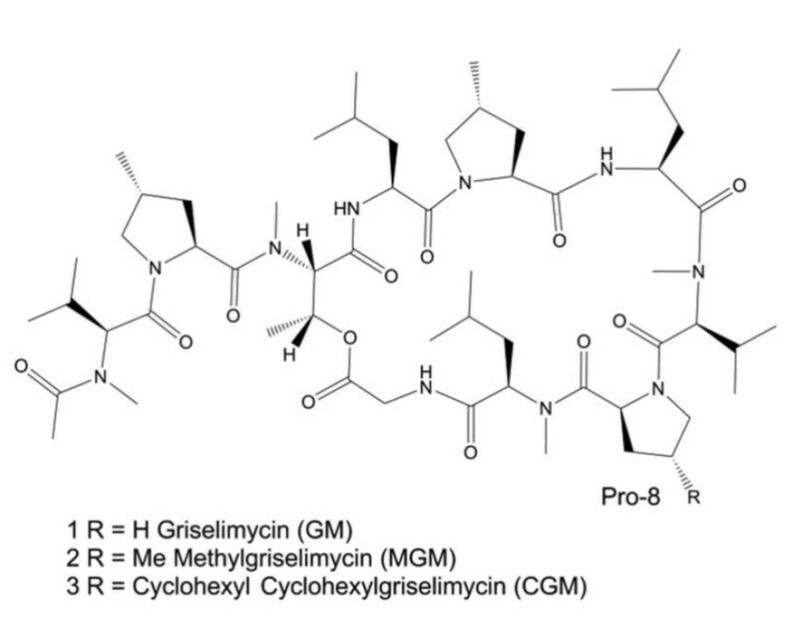 Our results demonstrated that griselimycins had high translational potential for tuberculosis treatment, validated DnaN as an antimicrobial target. Griselimycin is a natural cyclic peptide isolated from Streptomyces species. Lead optimization of Griselimycin resulted in identification of a novel synthetic analog derivative Cyclohexylgriselimycin (CGM). DNA Polymerase sliding clamp (DnaN) has been identified as the target. CGM profiling confirmed the interest of this new class for TB treatment. An update on this program will be done and the selection of the most promising advanced lead for further late preclinical studies will be presented. SATB-082 demonstrated dose-depentent efficacy in acute TB mouse models and prevented mortality at 25 mg/kg. MED is 50 mg/kg and MBD is <200 mg/kg. Replicating MIC is 0.04 to 0.11 uM and was inactive in the LORA. It is inactive against gram negative and gram positive strains tested. SATB-082 has a safer profile than CGM.